http://www.radioreference.com - A GOOD resource for programming radios! Antenna Analyzer Forum - General discussion forum for antenna analyzers. More Links to AIM4170 Info - Very interesting links by Ian, G3NRW. Network Analyzer Tutorial - Good tutorial on the basic principles of network analyzers. Antenna Modeling - An excellent resource on antenna modeling software. Be sure to checkout the program called Transmission Line Details. Comparison chart for three models of the AIM. 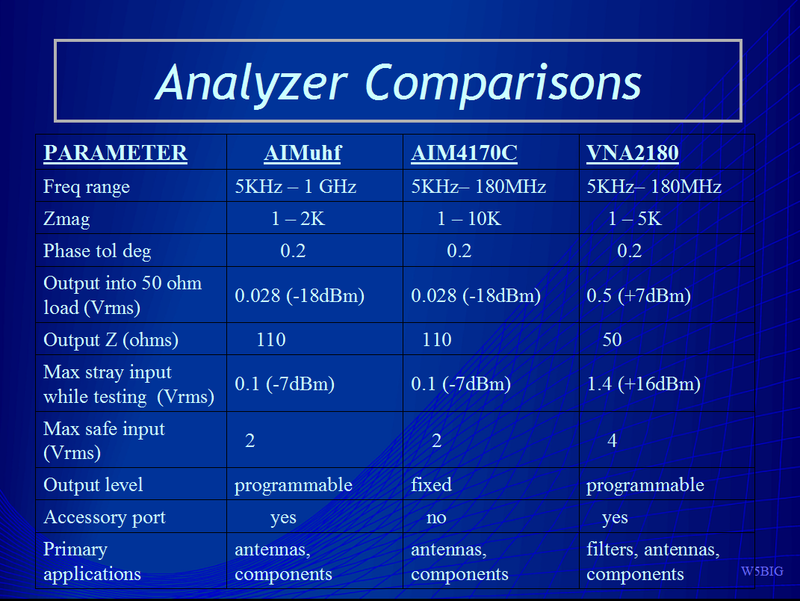 The AIM compared with several other antenna analyzers. Tutorials - An interesting collection of tutorials on a variety of topics involving electromagnetism, including, transmission lines and Smith charts. TDR applications - A very good article on transmission lines and TDR measurement concepts by Tektronix. Spectrogram - Some tips on using Spectrogram for aligning ham receivers and links to several very good Spectrogram tutorials. EZNEC - A very nice antenna modeling program by W7EL. Antenna Match Calculator - An interactive calculator to find the values of L & C to match an antenna. Several matching circuit configurations are included. Speq Math - An easy-to-use program that does a wide range of mathematical functions with complex numbers. Coax Parameters - A concise list of the basic parameters of many types of coax. Belden Cable College - Useful information on cables. Times Microwave - Information on high quality coax. Top Spice - a very good program for analyzing electronic circuits. The free version can handle circuits of medium complexity. Very useful and very educational. Download file is only 3 MegaBytes. Ness Engineering - Several good articles on fundamental electronic technology. Analog Techniques Tutorial - Good tutorials on basic electronics. Finite Element Method Magnetics (FEMM) - an outstanding free program for simulating magnetics problems. It allows an unlimited number of meshes. Wiretronics - a good source of wire information. Eveready Battery Data - technical information on batteries. An elementary course on electromagnetism and other topics in physics. A good introduction to DC electronics. A good introduction to AC electronics. Magnetism: quantities, units and relationships - A good summary of magnetic terminolgy. International Rectifier - A good source of information on power transistors and FET's. Info on Transistor Models - good information on the parameters used in the SPICE transistor model, on the Zetex web site. Zetex SPICE Models - SPICE models for all the Zetex products are available here. Complex Number Calculator - A very nice calculator for working with complex numbers. You can put it on your desktop. Scientific Calculator - a very handy scientific calculator. http://www.hackaday.com – A blog about DIY hardware that also often has SDR related posts. http://sdrformariners.blogspot.com/ - SDR for mariners. A new blog about marine related RTL-SDR applications. http://www.EEWeb.com - A large electrical engineering news and community website that sometimes feature SDR related stories.